Chipotle Mexican Grill was founded by Steve Ells in 1993 in Denver, Colorado. Today Chipotle has over 1,400 restaurants in the United States, United Kingdom, Canada and France. The remarkable growth of Chipotle was driven by Steve Ells’ passion for cooking and a purpose to change the way people think about and eat fast food. Steve attended the Culinary Institute of America in Hyde Park, New York. He graduated in 1990 and moved to San Francisco and worked under Jeremiah Tower at Stars restaurant. He always had a strong desire to open his own restaurant. The inspiration for Chipotle came from his visits to little taquerias in the mission district of San Francisco who served burritos with fresh authentic ingredients. Ells felt that he could apply what he had learned as a chef with a little twist and create burritos and other entrees that were not your typical fast food experience. He believed that Chipotle could elevate the fast food dining experience. A trip to an independent farm in Iowa informed Ells vision, mission and purpose for Chipotle. He learned that the vast majority of pork in the United States was raised in confinement. This led to him to develop a mission based on providing “Food with Integrity.” Food with integrity is Chipotle’s commitment to finding the very best ingredients raised with respect for the animals, the environment and the farmers. It means serving the very best sustainably raised food possible. Chipotle promotes its farm-to-table-to-consumer supply chain. It has built on its original “Food with Integrity” concept through a multi-pronged initiative to “change the way people think about what they eat. 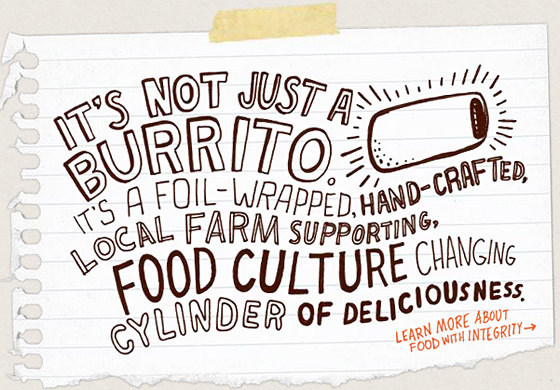 In 2011, Chipotle launched a “Cultivate a Better World” campaign that focused on connecting with consumers emotionally, and telling the story of why Chipotle sources sustainable foods. Chipotle is a great story of innovation and brand building. They have changed the way we think about the fast food dining experience. They have made money while impacting what we eat in a positive way. Have you eaten at Chipotle Mexican Grill and one a scale of 1-10 with 10 being the highest how do you rate the food?